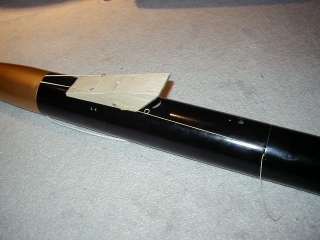 One way to enhance the pictures taken by a camera rocket is to add a mirror that looks down the side of the rocket. This lets you take stunning liftoff shots and because part of the airframe is visible in the shots adds some perspective to the pictures. Now you know they are taken from a rocket! 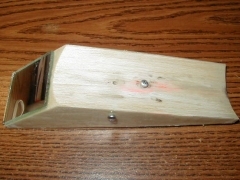 The mirror assemblies I have experimented with are fairly simple designs. For AYUCR I made two mirrors. The first of the two was a bit too small and not at the proper angle. I assumed originally that 45 degrees would work best but that gives a bit too much of the rocket body in the shot. You want some of the rocket to show but not dominate the frame. I have settled on 50 degrees as optimal. 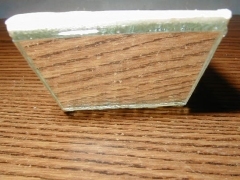 Both mirrors for AYUCR were made by making a balsa frame and filling them with epoxy. I did this by affixing waxpaper to the body, holding the frame to the body with rubber bands and pouring epoxy into the frame. 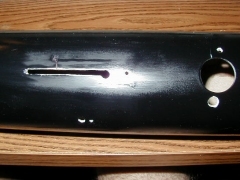 While this made the mirror assembly conforms nicely to the airframe it weighed alot and I almost had a disaster with the tremendous heat generated by this much epoxy curing. Don't make your mirror this way. 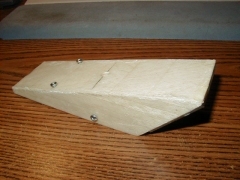 For AYUCR II I made a mirror out of a block of balsa shaped on a disk sander. 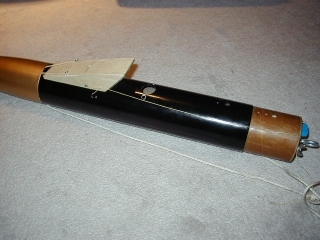 I attached sandpaper to a piece of tubing to sand the bottom to conform to the airframe. The balsa mirror assembly is coated with a layer of 1/2 oz fiberglass to make it more durable. This is a much better way to go. The assembly is lighter and it took less time to make. 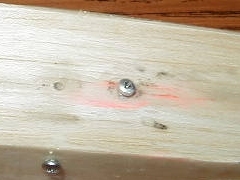 The mirror itself is attached using epoxy. For the mirror itself I am using a piece of standard mirror glass. A first-surface mirror would be better but I have gotten good results with a standard mirror.